We here at Altus Press are pleased to announce our new line of pulp t-shirts. These are authorized, 100% authentic, and are completely faithful to the original logos that appeared on the actual classic pulp magazines. 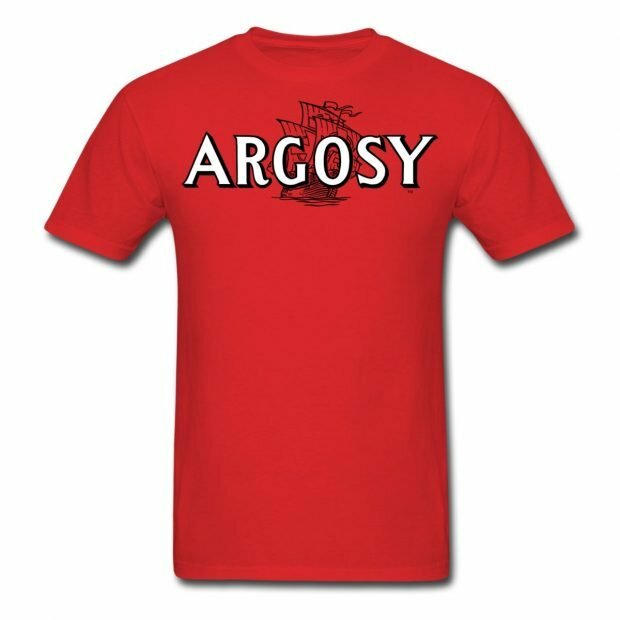 In fact, if you wear, for example, your brand new Argosy t-shirt at your next get-together with Frank Munsey, we fully expect him to compliment you for your fine taste in attire. These are made of high-quality fabric and are meant to last. And the printing is crisp and bright. They’re normal fit, classic-cut, standard weight, 100% pre-shrunk cotton, made by Gildan.These pulp t-shirts are available in a variety of sizes and are printed in the U.S.A.
Our initial wave of t-shirts are comprised of Argosy (the 1930s version), Famous Fantastic Mysteries, Dusty Ayres and His Battle Birds, and Dime Detective Magazine. To remain as faithful as possible to the magazines these logos graced, we’ve limited the fabric colors to those which were the primary colors for each magazine. We’ll be adding more logos in the future, so keep an eye on Altus Press.com for new designs.